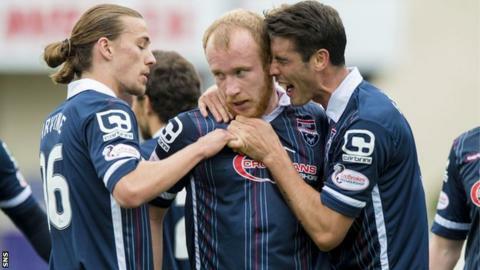 Ross County manager Jim McIntyre believes his side are equipped to achieve a top-six finish this season. The Dingwall side currently lie fourth in the Scottish Premiership and are in Monday's League Cup quarter-final draw after thrashing Falkirk 7-0. "That's certainly where we would like to be," McIntyre told BBC Scotland. "We've started the season really well and got ourselves into the top six at the moment. The hardest part is going to be staying there." McIntyre's side, who visit Dundee on Saturday, are unbeaten in six matches since a 2-1 reverse to Hearts on 15 August. "I believe that the team are good enough," he said. "We said at the start of the season that was our aim. "We're eight games in. There's three-quarters of the season still to go so there's a lot of football still to be played. "What's getting us our results is hard work, determination and a wee bit of luck as well. "We're certainly a real threat going forward and defensively we've done a lot of things well too. "We try and press teams and put them high and under pressure to make mistakes then hopefully you capitalise on it." County have continued their impressive run of form from the end of last season when eight wins in nine games eased them away from the relegation play-off place, eventually occupied by Motherwell. McIntyre admits he has sympathy for their former manager Iain Baraclough, who was relieved of his duties following their League Cup exit to Morton. And the County boss, who has been in charge at Dingwall for just over a year, believes the nine months given to Baraclough at Fir Park is not enough time. "I don't but we're in a world and a job where we know pressure can mount very, very quickly," he explained. "That's how it's important that when things are going well you don't get too carried away. "You can have a poor month, or six, seven weeks then all of a sudden that pressure goes from one manager to another and it's your turn to feel the heat. "You never want to see any manager lose his job."